Coldsearch.com is a search engine which you can be provided with by a browser hijacked called Coldsearch.com. The search engine is administrated by EMG Technology Limited. Moreover, this search engine is associated with a cunning browser hijacker that promotes key-find.com. Coldsearch.com can generate advertisements and sponsored links, which you should avoid clicking on in order to prevent redirection to unknown websites. Our advice is to remove Coldsearch.com from the computer as soon as it gets onto your computer and changes the home page and the search provider of your Internet Explorer, Google Chrome or Mozilla Firefox. If you are wondering how this intruder has been installed onto your PC, bear in mind that there are many freeware websites where you can find bundled installers. Several free programs can be distributed by a single installer, and if you pay no attention to the information that you are provided with, you may skip some important information. 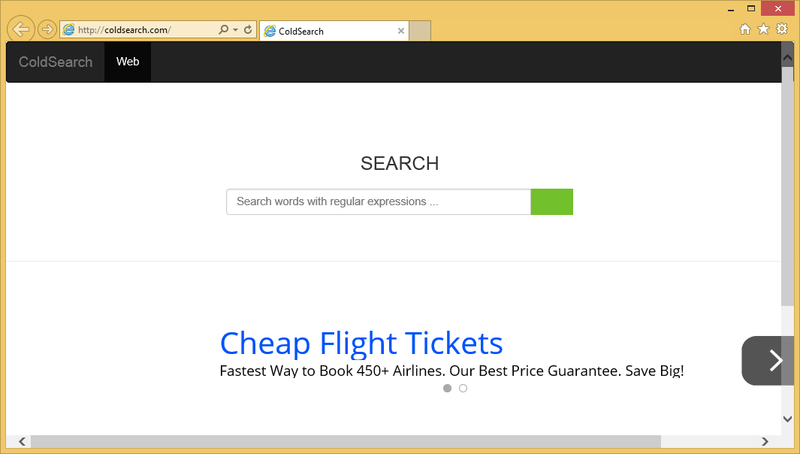 It has been found that the browser hijacker Coldsearch.com can be bundled with Quick Start, which can be easily removed from the computer by a spyware removal tool. If you install WiperSoft, it will remove Quick Start as PUP.Suptab. The browser hijacker has also been found to be capable of modifying your browser shortcuts so that you cannot replace the home page. If you decide to remove Coldsearch.com manually, it is crucial that you uninstall the browser hijacker and only when change the settings; otherwise, your efforts will give you no results. Coldsearch.com is very similar to aartemis.com, nationzoom.com, awesomehp.com and other browser hijackers because the behavior they exhibit when present on a computer. If you want to prevent unauthorized changes on the browsers, system malfunctions and data loss, you should pay more attention to your online security. The computer should be protected against malware and spyware by a legitimate and powerful security tool. If you have no reliable spyware and malware prevention tool, we recommend that you implement WiperSoft, even though below you can find our instructions on how to remove Coldsearch.com from the browsers manually. The recommended application will remove the browser hijacker and other undesirable programs if any are present. Do not hesitate to implement WiperSoft if you like trying out free applications. If you accidentally install some harmful browser extension or fake system optimization tool, the anti-spyware program will immediately inform you about the danger of the application. Check the box and click Reset. Click Setting (left side of the browser window). Under Search, click Manage search engines and select a new default search provider. Do not forget to scan the computer with WiperSoft after you remove Coldsearch.com from the browsers. Click the button below and install a free scanner.